Today I wanted to paint the chocolate-coated candy. In my painting there is only one! I used Burnt Sienna as an underglaze, then I used VanDyke Brown to glaze over that to create more of a chocolate color and some of the deeper shadows. French Ultramarine Blue was used for the deeper shadows in this candy - but each color was applied after the other glazes had dried. 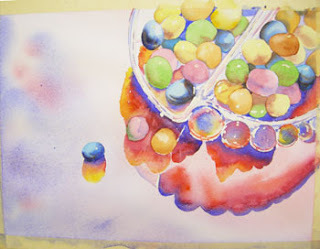 I also used French Ultramarine Blue and some of the other, previously used colors, to develop the shadow areas around the candies that are in the dish. Be sure to check your photo reference to capture the value, shape and color scheme of each of these little shadow areas. This is a good time to correct some of the candy shapes if they are not quite perfect!